Distributor / Channel Partner of a wide range of products which include manual spiral binding machine, heavy duty spiral binding machine and spiral binding machine. Keeping in mind, ever-evolving requirements of our valuable clients, we are offering an exclusive range of Manual Spiral Binding Machine. The offered range is wholesale using high grade basic material and latest technology in compliance with industry standards. Our esteemed clients can avail this array at competitive prices. In addition to this, we provide our entire range in different specifications to meet the varied needs of clients. With our consistent focus on globally hit trend, we proudly introduce a wide assortment of Heavy Duty Spiral Binding Machine that can bind up to 250 sheets of 70 gsm Paper. Our offered machine is widely acclaimed for its indispensable features. This machine is designed using high grade basic material and contemporary technology keeping pace with current market standards. Furthermore, our adroit team of quality controllers performs a series of quality tests on the offered range to ensure a defect free delivery at clients' end. 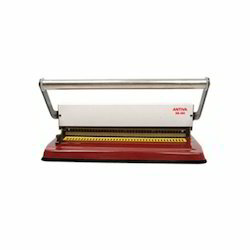 We feel immensely pleased to offer an exclusive gamut of Spiral Binding Machine. 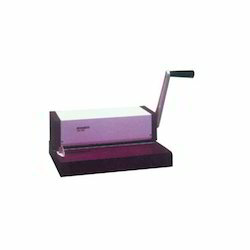 Provided machine is used in offices and other related places for binding books. Our offered machine is wholesale by utilizing optimum quality components and advanced technology by our skilled professionals. In order to ensure quality, this machine is rigorously tested on various parameters. Additionally, we provide the entire range in various technical specifications, as per the ever-evolving requirement of our clients. Maximum Working Width 350 mm. Maximum Binding Thickness 51 mm. Punching Speed (sheets / hour) 4000 sheets/hour. Binding speed (Books/hour) 40 to 50 books of 100 sheets. Material of Machine Body Mild steel powder coated. Machine Dimensions (mm) [LxDxH] 415x225x300. Looking for Spiral Binders ?